NOTE: Optional Extended Platform will add ≈ 10″ to the overall width. Transfers 24 to 26 wafers between one standard pitch plastic cassette and one custom process boat in a contact back-to-back configuration. 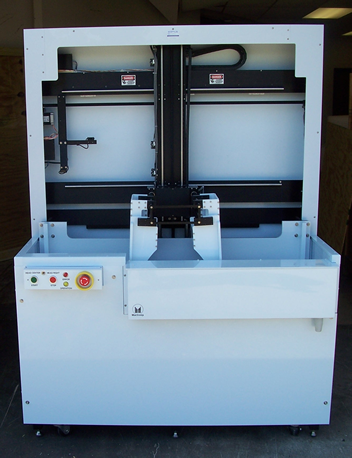 As with all Mactronix wafer transfer systems, the MacLite Series may be configured to accommodate a wide range of Plastic, Teflon®, Metal, Quartz, Silicon Carbide, and Polysilicon carriers. Machine interface is a 12 key pad with a 4 line LCD Display. Designed to limit particle contamination by using lead screw drive and stepper motor, “clean room grade” rails and bearings and electric boat sensors. 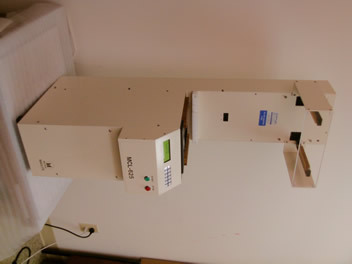 Machine will not drop wafers in the event of a power failure and will prompt the operator through the “Recovery Mode” after power has been restored. A “Technician Mode” is provided to facilitate preventative maintenance.